Conky is a free, lightweight system monitor for X, that displays any information on your desktop. There are many nice themes available for conky, that can display clock, CPU usage, ram usage, swap, disk, net and more. In this tutorial, let us see how to install and configure Conky-Lua. This theme (See screensot bellow) allow you to display nice rings for Clock, cpu …, and it is available for Ubuntu, Linuxmint, Fedora, openSUES and Debian. First of all, we need to install conky. Enter the following command to install conky. Now, download Conky-Lua from here. Then, go to the directory where you have downloaded the Conky-lua zip file and extract it. All files will be extracted in a folder called Conky-lua. Go to the folder and pick a file and extract it depending upon your distribution. 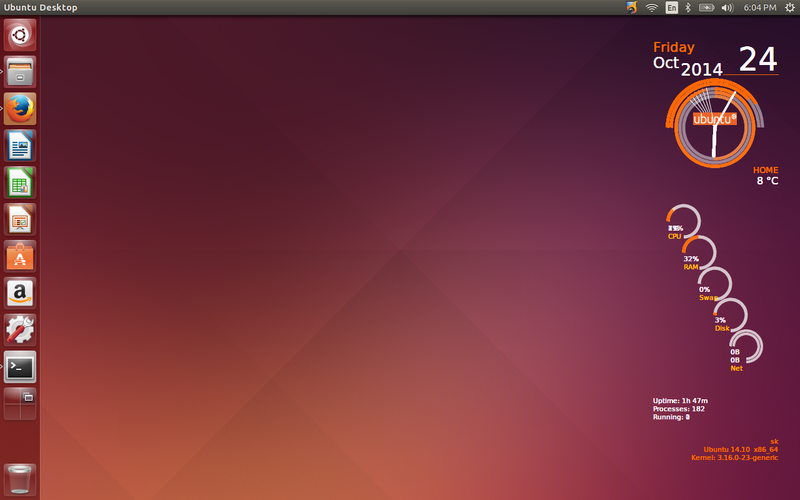 As I use Ubuntu 14.10 desktop, I extracted the file Conky ubuntu-lua.tar.gz. if you use Linux Mint, then extract the file Conky Mint-lua.tar.gz. 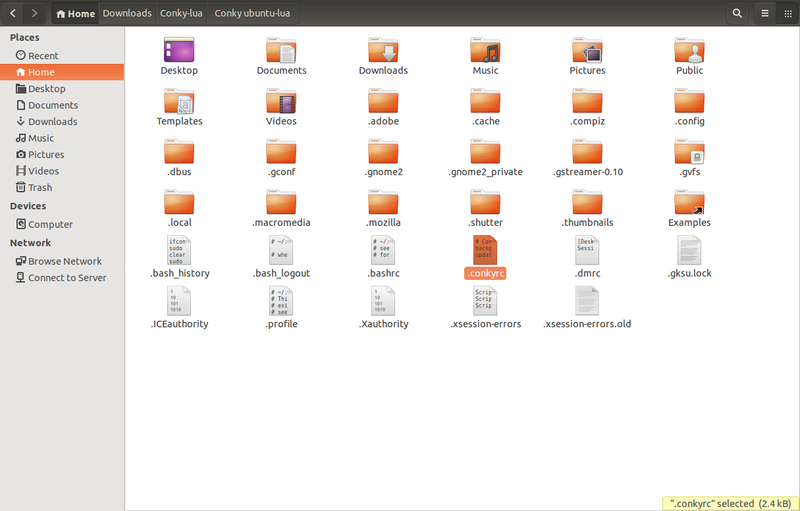 As I told you before, I use Ubuntu 14.10 desktop, so I extracted the file Conky ubuntu-lua.tar.gz. This will be extracted in a folder called Conky ubuntu-lua. Go to the directory, find the file conkyrc, and rename it to .conkyrc. Make sure you have put the dot(.) at the beginning of the file. Now, move the renamed file .conkyrc to your home directory. Hence, we have put the dot(.) at the beginning, so this file will not be visible. To make sure this file is moved to the home directory, go to View -> Show Hidden files in your file manager. 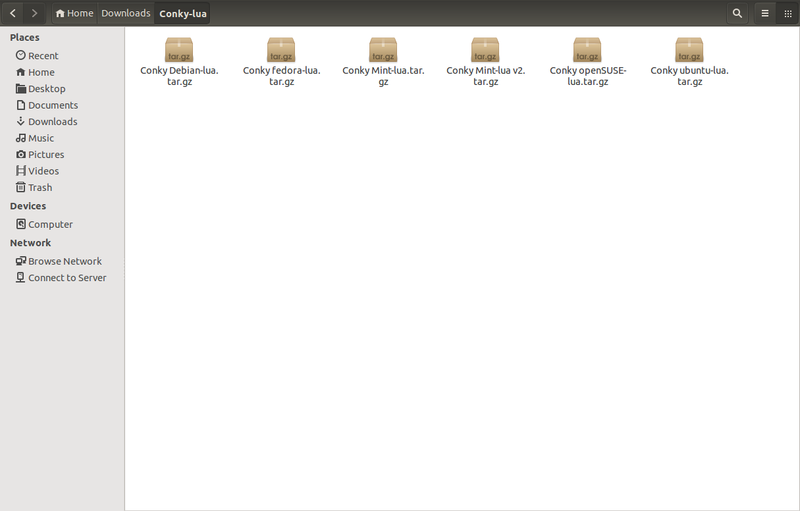 As you see in the above screenshot, the file .conkyrc has been moved to the home directory. Then, create a new folder called.conky in the home directory, and copy the other 2 files to this folder (new-ubuntu-logo.png and clock_rings.lua). Now, look at your Ubuntu desktop. The conky-lua theme will be running and displaying all details such as date and time, usages of CPU, RAM, net, disk and swap etc. This method is same for all distributions such as Debian, Fedora, OpenSUSE. Due to lack of time and resources, I have checked this article only on Ubuntu 14.10. Now, conky should start automatically on every reboot. Note: If you are using wireless, and you want to display the wireless status on conky, edit file .conkyrc and change eth0 towlan0. And, replace eth0 with wlan0.